Disclaimer: My original guest-post was first published on The MacGyver Project on April 14, 2017. I made some minor changes (e.g. grammar or source corrections, link corrections, author’s note) before re-posting it on my own blog for safe-keeping. It’s Season Finale Friday! 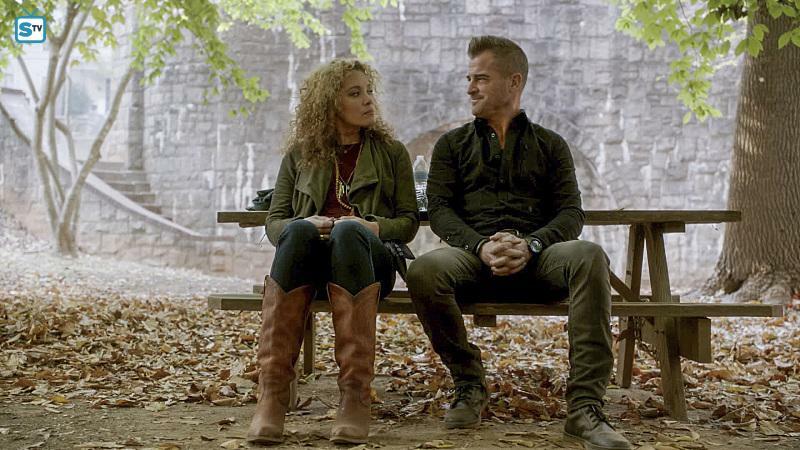 Fans don’t have to be sad, though: The show will come back for a second season! It’s a wrap! Well, kind of? Cast and crew had celebrated the official wrap party on March 19, although shooting wasn’t done yet. 2nd Unit did some additional filming on March 21. Interestingly, Kevin Marshall (Stand-In for George Eads) was still shooting inserts on March 31. 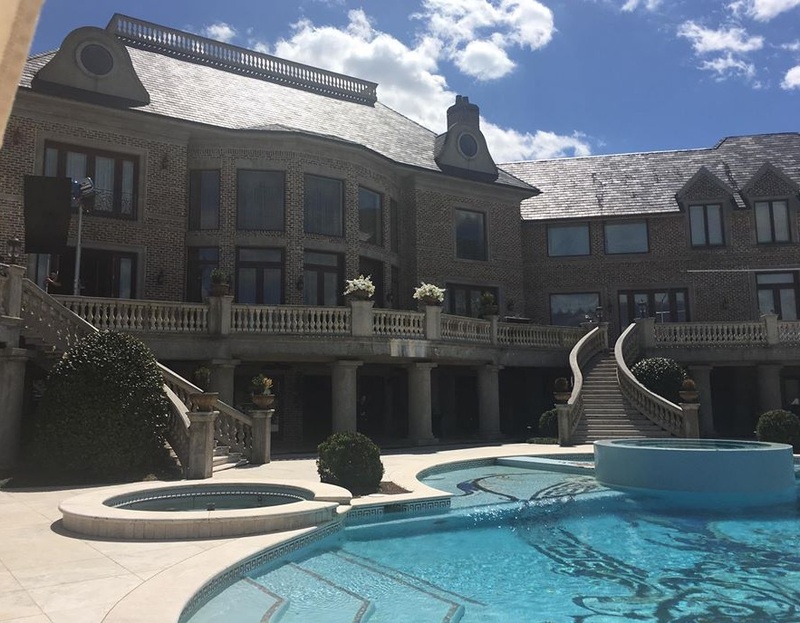 The crew was apparently awed by the location and posted several pics of the mansion and the swimming pool. Since the location doesn’t fit very well with what we’ve already seen in the previews and sneak peeks, this could get interesting. Maybe something to do with MacGyver’s father? As always, there was still post-production-work to do. While Tristin Mays had been doing ADR (Automatic Dialogue Recording) for Episode 20 (Hole Puncher), David Dastmalchian posted a picture of Lucas being in the studio with him to do the necessary ADR work for the Season Finale. Executive Producer Peter Lenkov shared short videos while editing the last episode (e.g. MacGyver fighting off a knife attack and Riley again being attacked from behind, but this time being prepared). Now that filming was over, the main cast and crew engaged more often on social media to tease us for the premieres of the last two episodes of the season. We got several BtS pictures with David Dastmalchian as Murdoc (e.g. in the Season Finale, with Assistant Director Cornell Willis or with Meredith Eaton’s Stand-In Saundra Coller). 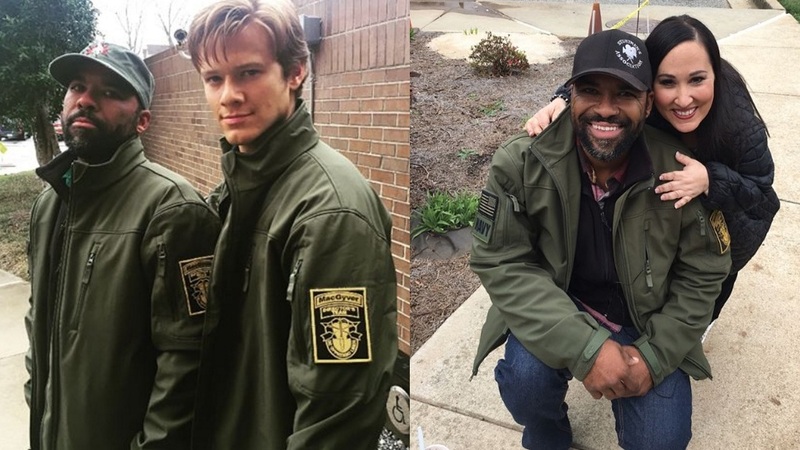 Cornell Willis shared BtS pictures with Lucas Till and Meredith. Justin Hires posted a picture of his character Bozer lying on the floor with a bloody shirt, stating “I hope to God I survive this episode” (I don’t think we have to worry too much about that). Some of the crew also shared BtS stuff from earlier episodes. Stunt Double Caine Sinclair shared a video of the window stunt scene in Episode 15 (Magnifying Glass) while Set Costumer Christopher Opopo posted the same stunt filmed from a different angle and a picture of that day. Ratings have been falling again. Although the episode was written by Lee Zlotoff and well received by fans, Episode 19 (Compass) had the lowest ratings of the season so far with 6.56 million viewers (along with a 0.9 rating in the 18-49 demo group). Last week’s Episode 20 (Hole Puncher) did slightly better and garnered 6.62 million viewers (with 0.9 in demo). Nonetheless, the ratings are still pretty good. The Season Finale not included, the show had 7.79 million live-viewers per episode, along with a 1.09 rating in the 18-49-years demo group. The reruns (nine episodes so far) had 4.37 million viewers per episode (with 0.67 in demo). I’m no expert, but I might look more closely into the ratings in another Update (just because I like to look at data, creating graphs and pretending to know what’ I’m talking about *lol*). After complaining about not getting an episode-related preview for Episode 19, we did get an official trailer for Episode 20. On the other hand, we didn’t get any sneak peeks at all. The only other time this happened was for Episode 3 (Awl). Thankfully, we got a trailer for Episode 21 as the Season Finale and a First Look by Entertainment Weekly on Mark Sheppard. Today, we also got two Sneak Peeks. 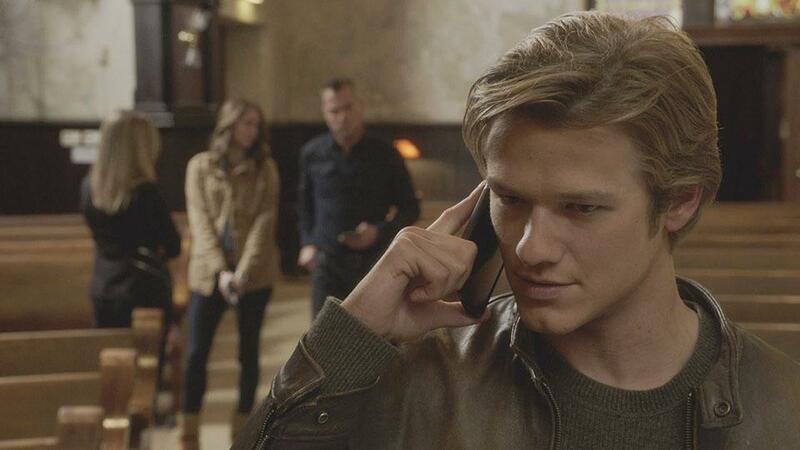 One of these Sneak Peeks mentions MacGyver’s father which didn’t happen for a while. I’m pretty sure he will either play a part in tonight’s plot twist or show up in person the next season. 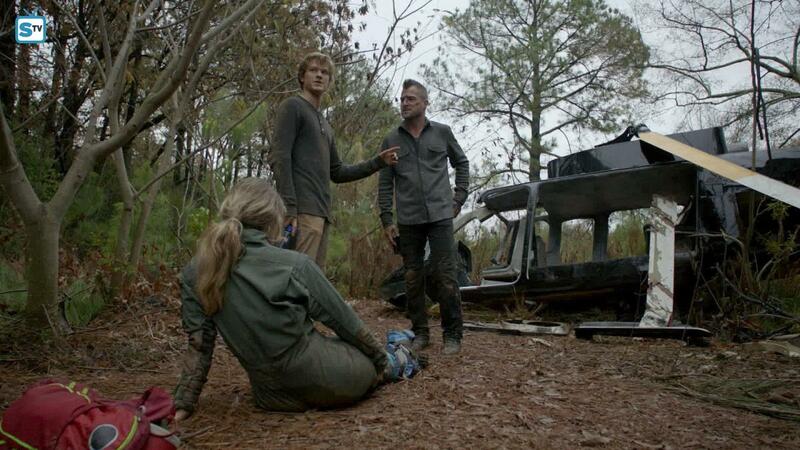 In another Sneak Peek via Yahoo, we see MacGyver (plus robot) trying to save Bozer’s life. Yahoo looks back at the original Dr. Zito and talks with Lucas about the differences between the two halves of the first season episodes. In an exclusive clip via Entertainment Weekly, we see MacGyver and Jack on that mission in Cairo they never want to talk about (and proof that Jack has no respect for Egyptian artifacts). The impending Season Finale brought on another round of promo interviews and articles. An article by CGW (Computer Graphics World) about the sound editing of the reboot revealed one of the reason behind the constant background noise (music, sorry. it’s music, of course): Atlanta has some very loudly chirping cicadas that “could betray the show’s real location”. In an interview with Matt Carter, David Dastmalchian talked about Murdoc and his appearance in the last two episodes of the season. On April 11, Henry Winkler talked about what makes (Original and rebooted) MacGyver so special. Tristin Mays did a short video interview and a photoshoot with The Wrap. She revealed that the season finale will give her character a wake up call – meaning “more training, maybe some weapons” next season. Hm. 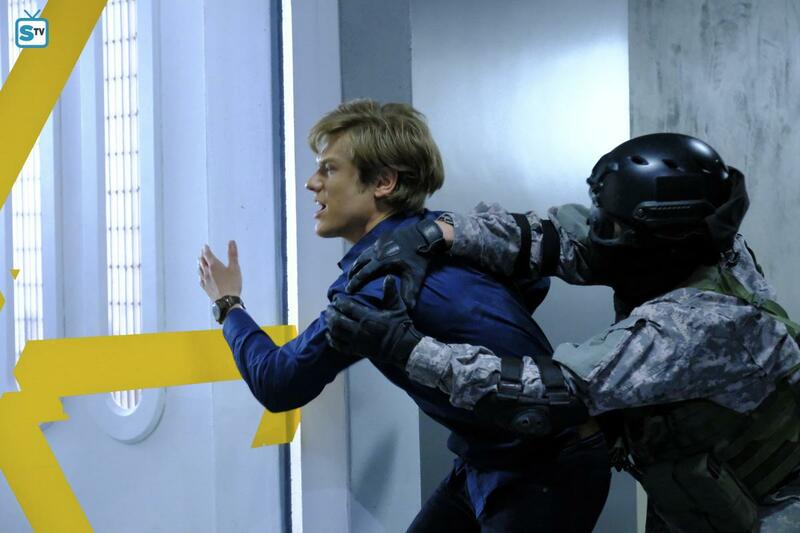 Good to know that MacGyver will soon have TWO members in his team that can wield weapons around him *ahem*. In another video interview with Young Hollywood, Tristin talked about her visit to Hawaii last week, the possibility of another crossover with Hawaii Five-0 and Riley’s wardrobe. In the interview with TooFab, Tristin calls the Season Finale “outrageous” and mentions that she has to get into shape for next season because there will be more action. Meredith Eaton and the rest of the cast talked about Matty and why she’s the perfect boss for the Phoenix Foundation. They also talked about their favorite moments of this first season where George Eads revealed that a lot of the puns were added (and sometimes ad-libbed) by the cast. 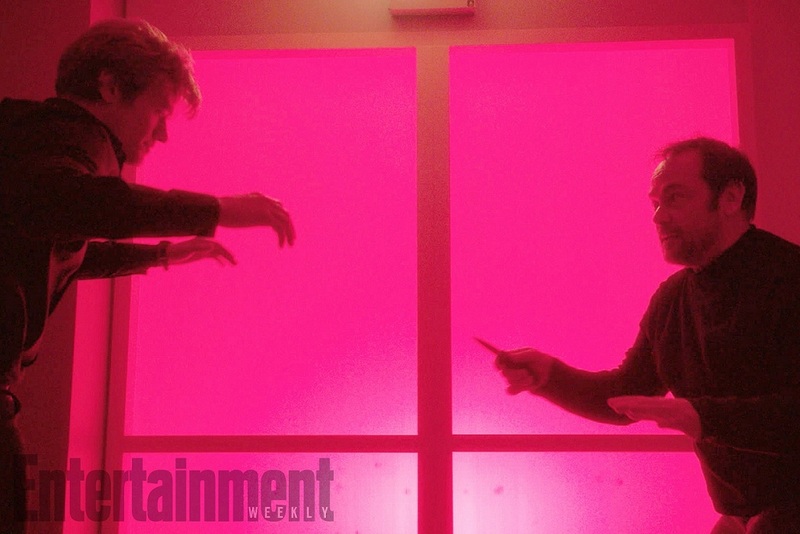 We already know that we get Murdoc and Dr. Zito for tonight’s Season Finale, so probably no more surprises. Many fans hoped for an appearance by Patricia Thornton or Nikki Carpenter. 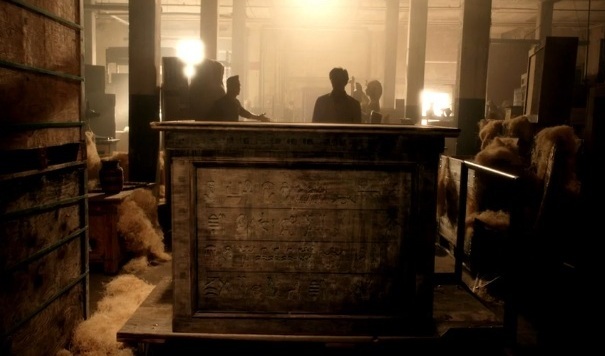 Thornton seems unlikely, but Nikki was on the Cairo mission (as mentioned in the Pilot Episode). According to a recent interview, Tracy Spiridakos wouldn’t mind to do another episode. Peter Lenkov revealed that Season 2 will see Riley and Bozer having relationships – with other people. So we might be introduced to new recurring characters soon. Let’s hope the writers keep the relationship drama at bay, though. Tristin Mays garnered some instagram attention on April 5 when Peter Lenkov posted a video of Tristin arriving in Hawaii with her brother. She enjoyed some well-earned vacation days, but also attended the Wrap Party of Hawaii Five-0 which raised questions of her appearing in the show as a guest star. Maybe it was Lenkov’s way of apologizing for not getting her to Hawaii for the crossover episode (in fact, all of her and Justin’s scenes had been shot in cold Atlanta). As mentioned above, the Season 1 Finale airs tonight. On April 21, there will be a rerun of Episode 10 (Pliers). 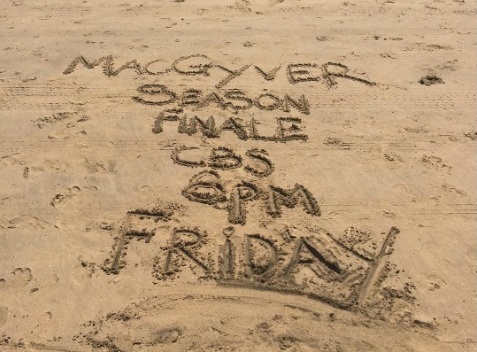 Now that The Amazing Race doesn’t air on Fridays as initially planned, they will probably air reruns of the other MacGyver episodes. Although the reboot was one of the best sold shows at the upfronts last year, it is still waiting to be released in other countries. The season renewal might help with that, though. It will air in France soon and is set to premiere in Japan in June. The premiere date of Season 2 is not set, but it’s safe to assume it will be a Fall Premiere again; airing on Fridays before Hawaii Five-0 and Blue Bloods. In her AMA on reddit, Tristin Mays revealed that filming the new episodes will begin on July 6. She’s already mentally preparing for “Hotlanta”. Disclaimer: My original guest-post was first published on The MacGyver Project on February 3, 2017. I made some minor changes (e.g. grammar or source corrections, link corrections, additional pictures) before re-posting it on my own blog for safe-keeping. Cast and Crew were freezing on set while filming the residual episodes for Season 1. Maybe that’s why they liked playing with fire so much last week? While the fans had to endure another premiere break of 3 weeks, cast and crew stayed busy filming more episodes and doing their homework. First Assistant Director Anthony Kountz showed us what filled his days: Warehouses, Mondays and impressive camera equipment. Camera Operator Tiko Pavoni posed with a sleek looking Aston Martin Vanquish that was waiting for his scenes in the (now drained) warehouse. Like the helicopter for the last episode, the car was featured in several videos and Instagram posts. Executive Producer Peter Lenkov took some more of his precious time to post videos and pictures during the editing process. On January 23, he posted some videos of the team sitting around the fireplace on MacGyver’s veranda; eating, joking and getting pranked by their new boss. A day later, Lenkov posted a video of his cold office, doing a sweep over cast-pictures and the script he was currently working on (seems like MacGyver’s birthday will come up soon). One of the editing videos showed Lucas Till “macgyvering” (on a robot? ), another one Mac and Jack being in trouble (read: quicksand). We also got to see Bozer getting comfortable in his new James Bond Persona. Justin and Tristin post a lot of Instagram Live Stories videos at the moment, but every now and then we also get a non-temporary look at the cast in disguise (read: wearing coveralls and Bozer’s prosthetic noses). Cast and crew were seen filming outside for several days. The cast seemed to have fun despite the freezing temperatures and having to work over the weekend. Also, there have been more comments about the production’s snacks table. On January 28, several outlets (e.g. 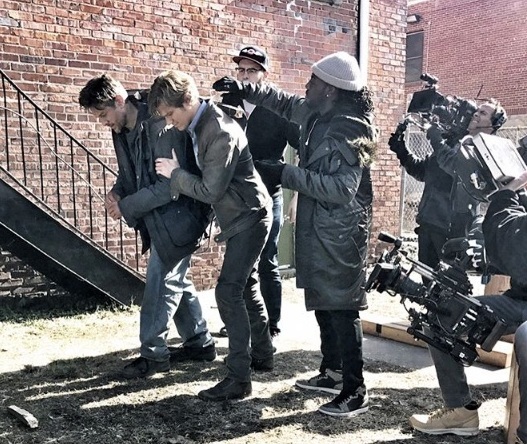 Atlanta Filming) posted about the show “blowing up sh*”. It didn’t take long for Peter Lenkov to post a video of a blue van exploding. Pretty impressive! While Lenkov’s video is seen via camera screen, Instagram-User bryttani showed the explosion from a wider angle. I’m not sure if all that “fire-play” for Episode 17 (Ruler) was as controlled as it was planned, though. Just the day before, Tristin Mays had posted a short video of Stunt Coordinator Jeff Wolfe instructing Lucas Till how to handle the self-made flame-thrower. It looks like Jeff burned himself (not to mention that Tristin had stamped a not so happy emoticon on it). Additionally, both Tristin and Justin Hires had posted videos that indicated production needing additional help from the fire departement. Interestingly, George Eads didn’t seem too much concerned about the seemingly out-of-control-fire; continuing to eat his sandwich. Judging by the clothes, the extras and the press release, Episode 17 might actually turn out to be a two-parter. We’ll see. Production continued filming in Marietta Square this week; featureing a stunt motorcycle, a truckload of bicycles and a set-redressing to stand in for Amsterdam. Many bypassers, extras and shops took the opportunity to post pictures; inadvertently also revealing some storylines (and possibly even spoilers; especially since some of these posts were deleted shortly after posting it). During the premiere break, there was a rerun of Episode 9 (Chisel) on Friday, January 27. The episode made some good ratings (5.17 million viewers). The long break was a good opportunity for the guest cast to remind us they will be in the next episode. We got to meet Agent Cho (Michael Tow), Stunt Driver Jason Gupton and Agent Eva Santos (Danielle Vasinova). CBS sure likes to keep the fans waiting. Although the preview for Episode 14 (Fish Scaler) had aired after last weeks rerun of Episode 9, the video wasn’t available on the official YT-Account until February 1st. Additionally, we had to wait until two days before the premiere to finally get stills and sneak peeks. On the other hand, we already got Press Releases for Episode 15 (Magnifying Glass), The Coltons-Episode 16 (Hook) and Episode 17 (Ruler). On January 24, CBS Watch! Magazine released the interview and the photo gallery for the shoot they had done back in October in the midst of a heat wave. 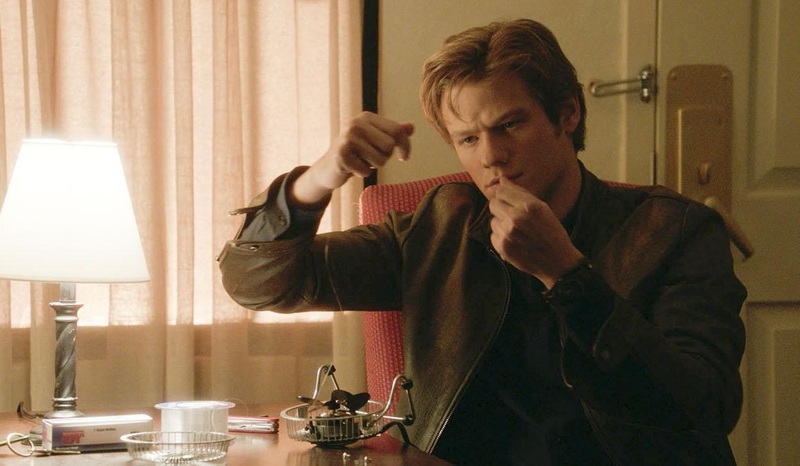 Lucas Till revealed that some of the gadgets can be really challenging, but that this is what makes so much fun while filming. 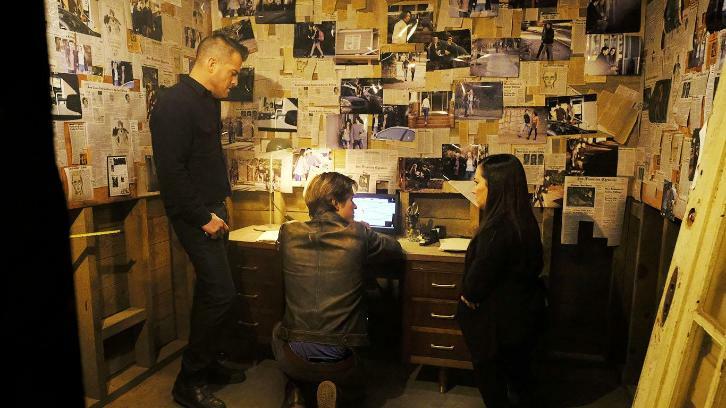 George Eads stated that Lucas’ enthusiasm and passion about doing the show kinda “rebooted” him after spending so many years on the same set (for CSI: Las Vegas). They also revealed that they practically spend all day together because they’re roommates. On the same day, Technical Consultant Rhett Allain shared another blog post – this time about Leyden Jars like the one used in Episode 13 (Large Blade). Central Casting Georgia had difficulties finding their pool shark and also took several tries to find European Bicycles. Additionally, they put out casting calls for Dutch Citizens and Students, an African-American Female in her 20ies and small cars. The most recent casting call is especially interesting, since they’re looking for Asian Extras (e.g. EMTs, nurses, doctors, paramedics, tactical and other military guys), in particular Hawaiian-looking Extras. We all remember Peter Lenkov talking about the possibility of doing a crossover with Hawaii Five-0 and that he still wants to do it. In fact, he had already laid the ground-work for it in the pilot episode, but the scene got cut. A look onto the IMDb cast-list reveals: Penny Parker (Bianca Malinowski) will be back in Episode 1×18! Hopefully, she will play a bigger part this time. If you throw characters of the original show into the reboot, you might as well start using them!